"Thank you to all of our loved ones who came out to support OTR2. And a huge thank you to the hardest working crew in show business. We couldn’t have done this without each of you beautiful human beings. To Shawn Carter, my Clyde, my best friend: this journey on OTR2 has been a highlight of my life. Thank you for every moment. I’ll be your hype man any day! To the Hive and all the fans who supported OTR2, cheers to you and I. Salud!" See all the recipients of the On The Run II Scholarship sponsored by BeyGOOD and the Shawn Carter Foundation below! "Thank you to all the brilliant scholarship winners. Continue to dream, work hard, and grind until you own your dream. You make us proud. "
Beyonce and Jay-Z performed during the On the Run II Tour at the BC Place stadium in Vancouver, Canada on October 2. Bey wore three new costumes! After the show, she wrote: "See you next time, Vancouver! Thank you for a great show." Last night Beyonce and Jay-Z performed during the On the Run II Tour at the SDCCU Stadium in San Diego, CA. Before the show, Bey wrote: "Lucky number 4! Lets go San Diego!" Yesterday Beyonce and Jay-Z performed for the second time at the Rose Bowl in Los Angeles. After the concert, Bey wrote: "Los Angeles, thank you for two unforgettable nights!" Last night Beyonce and Jay-Z performed during the On the Run II Tour at the Rose Bowl stadium in Los Angeles, CA. After the show, Bey wrote: "To everyone in Rose Bowl last night, thank you! Let’s do it again tonight." Beyonce and Jay-Z performed during the On the Run II Tour at the State Farm Stadium in Phoenix, AZ on September 19. Before the show, Bey wrote: "Thank you to my hometown for being the loudest crowd so far. 7 more shows. Phoenix let’s go!" 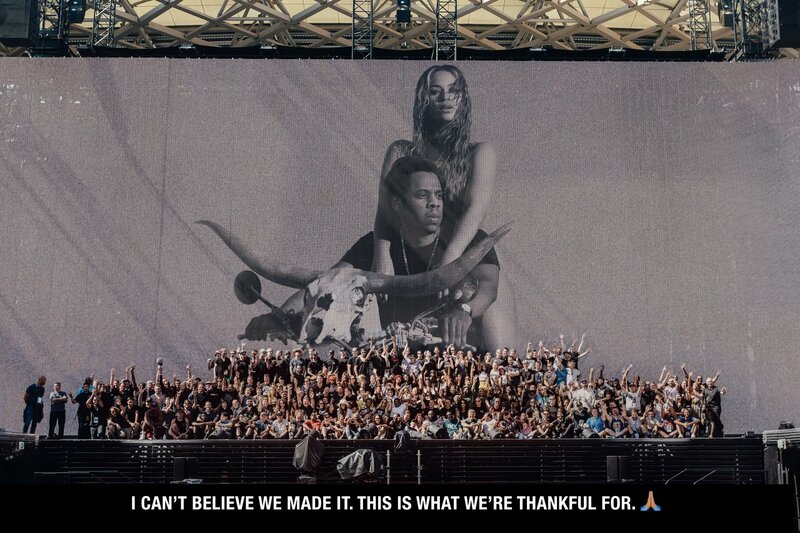 Last night Beyonce and Jay-Z performed for the second time at the NRG Stadium in Houston, TX. Bey wore a new opening costume. After the show, she wrote: "Two nights in H-Town complete! Thank you for the love!" Last night Beyonce and Jay-Z performed during the On the Run II Tour at the NRG Stadium in Houston, TX. Again, Bey had a new costume. Before the show, she wrote: "9 more shows. Houston I’m home!" The Carter's On the Run II Tour has been nominated for Tour of the Year at the 2018 American Music Awards. Vote now! The winners will be announced on ABC live from L.A.'s Microsoft Theater on Oct. 9 at 8 p.m.
Last night Beyonce and Jay-Z performed during the On the Run II Tour at the Mercedes-Benz Superdome stadium in New Orleans, LA. Bey wore a new costume! Before the show, she wrote on Instagram: "Tonight is the first of the last ten shows of OTRII. I’m doing what I love most with whom I love most. I wish it could never end. Feeling thankful for all of the love from our fans around the world. New Orleans, you ready? Let’s go get em!!!" Beyonce and Jay-Z performed during the On the Run II Tour at the AT&T Stadium in Arlington, TX on September 11.